The Prado seen from the Cabrillo Bridge. This piece is on display at the historic Marston House in San Diego as part of Art of the Park, an exhibition of paintings of Balboa Park dating from the 1915 Panama-California Exposition to today. 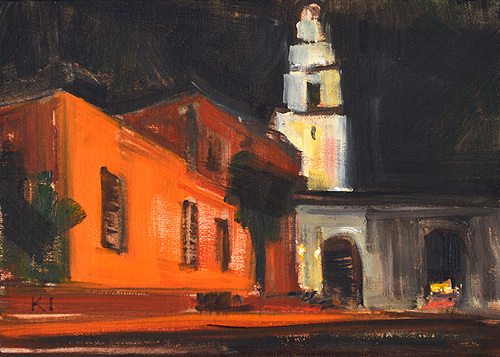 This entry was posted in Landscape Paintings, San Diego Paintings, Urban Landscapes and tagged 5 x 7 inches, california, marston house, night, nocturne, oil on linen on panel, prado, san diego on August 3, 2015 by Kevin.